Lawler’s new work infuses the idea of place, organisation, relocation and transformation through different states of being. The work incorporates the platform as an entity which is at times grounded, moving, suspended, tethered, hovering and at other times standing apart from the surrounding landscape. Recurring checker board motifs accentuate a definite but skewed anti-perspective, which herein add to a surreal, dreamlike sense of discomfort, where what appears to have been planned according to a perspectival logic is withheld and subverted. 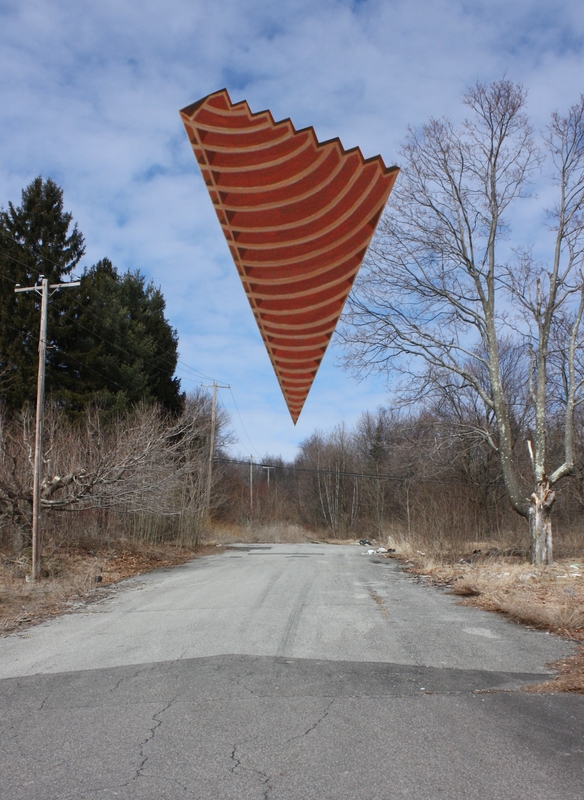 Her previous ’eminent domain’ exhibitions, based on the abandoned mining town of Centralia in Pennsylvania,USA, referenced the reality of a desolate landscape and the forced relocation of its inhabitants to a nearby borough. Suspended, grounded and hovering structures invoke these ghostly inhabitants, confronting the viewer with a wasteland, suggesting a vast and fragile future or past. These hypothetical architectural structures act as sentinels, observing at a distance, travelling perhaps to another place, appearing conspicuous at times or camouflaged by elaborate patterning. Aidan Dunne, The Irish Times, May 2018. ‘Smoke was hovering wispily off the ground, and just behind it, great volumes of smoke were billowing from the earth over a large area. I walked over and found myself on the lip of a vast cauldron, perhaps an acre in extent, which was emitting thick, cloud like, pure white smoke—the kind of smoke you get from burning tires or old blankets. It was impossible to tell how deep the hole was. The ground felt warm and was loosely covered in a fine ash’. I first came across the town of Centralia in Pennsylvania upon reading Bill Brysons book ‘A Walk in the Woods’ where I immediately felt drawn to his vivid description of this abandoned place. In my minds eye I imagined an area devastated by environmental disaster strangely preserved within the aftermath of its abandonment.Centralia began burning deep under its foundations in the 1960s when a vein of coal was accidentally set on fire. 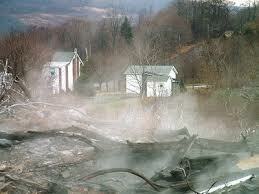 This vein burned intensely, so much so that the town began to form sinkholes and poured out toxic gases. 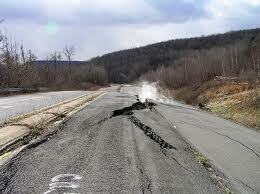 Centralia was declared unsafe in the 1980s and the residents were relocated to another area. 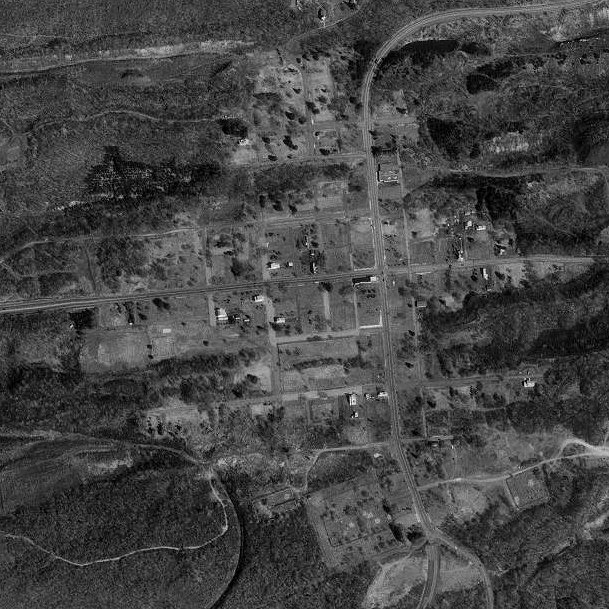 Centralia is now a floor plan of empty overgrown streets and remnants of buildings long removed. Its emptiness only adds to its strangeness and among its streets the memories of another time permeate with the smell of burnt earth. In my work I create structures which hover motionless and insistently above these wastelands, anxiously scrutinising the existing conditions for the possibilities of survival. I traveled to Centralia in March 2014 and using this research developed a new body of work based on abandoned places where economic and environmental factors have forced inhabitants to relocate. ’eminent domain’, my first solo exhibition with the Molesworth Gallery, references the reality of this mining landscape and employs fictional notions of escape and adaptation through the use of hypothesized architectural structures. These fabrications assume an autonomous vitality, investing the atmosphere with a cosmic foreboding. This desolate landscape once destroyed by mining now lies in silence, sunlight blocked by smoke filled fissures, roads vanish and crack under the pressure, trees stand deadly still; the ordered and composed versus the shapeless, unexpected and unstable. The first installment of ’eminent domain’ took place at Galway Arts Centre in 2014, followed by installment two at Pallas Projects, Dublin in 2015. 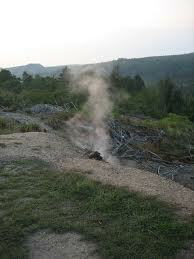 * Bill Bryson visited Centralia while walking the Appalachian Way in the United States. His shock, horror and interest in the devastation which lay before him sparked my own curiosity and thus began my journey to learn more about this strange place.